T he story of a people is the story of what and how they eat. And cooking school vacations can open the book to let you read that story. In Mexico, a rich blend of ancient, indigenous ingredients and colonial Spanish imports have created a complex and delicious local cuisine that can give you a whole history lesson. And learning to cook it yourself, on-site, while surrounded by the sounds, tastes, colors of Mexico, offers up a direct connection to the spirit of this special place. Nothing defines the culture of a country as instantly as its food. All over the world, we use food to mark the important moments in our lives. Food brings families together, sparks romantic encounters, and gives solace in sadness. It tells the story of the people, records their history, defines their taste. Cooking school vacations in San Miguel de Allende give you the whole package. They combine learning to cook traditional Mexican cuisine with such cultural encounters as a visit to the local market, an ice cream cone from a street stall, a wine tasting. You end up with a complete culinary experience, and you'll never feel the same about Mexico, or Mexican food, again. Put three generations of Mexican cooks in the kitchen—with a wide knowledge of classic techniques and time-honored recipes plus several decades of teaching experience between them—and you end up with some astonishing insights into the food culture of this country plus a whole lot of really great food you get to eat! The matriarch in the kitchen is Maria "YaYa" Marquez, who has been teaching classic Mexican cooking for nearly 50 years. The lead instructor is her daughter Patricia Merrill Marquez. And Monica Navarrete Merrill, the third generation, has training not only in the kitchens of her mom and abuela but also with a diploma in High Cuisine. All participants in this cooking vacation stay at Arcos Del Atascadero Bed & Breakfast. The 26 hours of instruction cover breakfast and a daily comida—the main meal of the day for most Mexicans—with evenings free to sample some of San Miguel's many fine restaurants. Kris Rudolph, who owns El Buen Cafe as well as La Cocina Cooking School, also organizes full-scale, week-long cooking vacations through her company, Culinary Adventures. Most of her cooking vacations last one week. Accommodations are in a fully-staffed restored colonial mansion right in the center of town. Hands-on cooking classes alternate with visits to the market, shopping sprees, private showings by local artists and jewelers, and excursions to neighboring towns. Kris teaches many of the cooking sessions herself but also invites guest chefs to cover more ground. The cooking vacation includes special sessions on discovering the amazing variety and subtlety of a huge range of chiles, preparing salsas, a class on moles, and one in Mexican Fusion cooking. Note: If you are not looking for an entire Cooking Vacation, find out more about Kris' single cooking classes in San Miguel de Allende here. 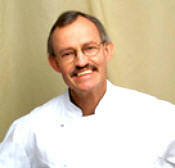 Hugh Carpenter is a Napa Valley, California chef and teacher who holds gourmet cooking vacations all over the world. One of his most popular is his "Camp San Miguel" cooking and art vacation in San Miguel de Allende. Classes in classic Mexican cooking techniques are balanced with visits to the studios of local artists and shopping excursions to local markets. Classes are taught by guest chefs, as well as Carpenter, in a hacienda outside town, a popular in-town restaurant, a cooking school/kitchen boutique as well as in the home kitchen where guests will stay. Sazon Cooking School, in connection with the Hotel Casa de Sierra Nevada, offers 4-day cooking school vacations in San Miguel. The culinary package includes classes at the school/boutique located right in the centro, just a few meters from the Jardin, as well as an outing to the market and dinners in private homes. Since Sazon is owned by the Orient Express, they have a great pool of fabulous chefs to draw on. Guest chefs from all over the world regularly give classes as part of this gourmet cooking vacation. Whichever trip and teacher you choose, one of the Cooking School Vacations in San Miguel de Allende will send you home with a deeper understanding not only of the food of Mexico, but of the country and her people as well.